Poorly managed development projects are bound to crash eventually. It’s likely happened to you a dozen of times already. While writing code can be a lot of fun, managing code and dependencies can quickly become a maze of its own when you’re dealing with the continuous growth of your codebase and feature branches. At Stackify, we aim to make the lives of developers easier (and less frazzling). One way to de-stress your work is with the aid of continuous integration tools. 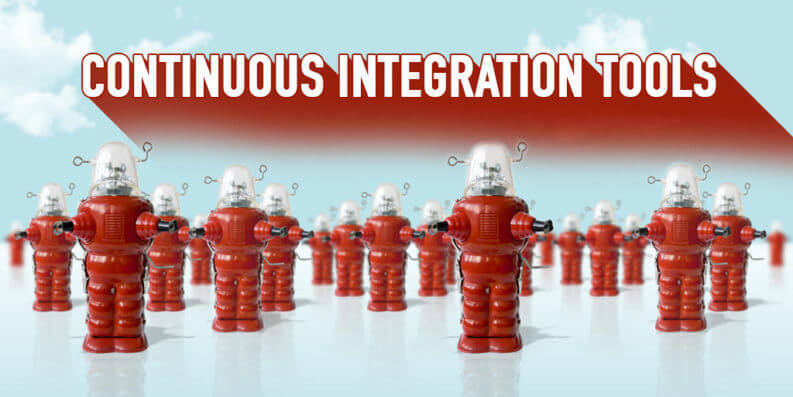 Below, we’ve rounded up 51 leading tools and software in the field of Continuous Integration. Some are core CI tools and others play nice with other tools to make CI even better, and many integrate seamlessly with the other tools and processes you’ve come to know and love (no breaking up with your favorite IDE required). Note: The following 51 CI tools are listed in no particular order. Travis CI is a CI platform that automates the process of software testing and deployment of applications. It’s built as a platform that integrates with your GitHub projects so that you can start testing your code on the fly. With customers like Facebook, Mozilla, Twitter, Heroku, and others, it’s one of the leading continuous integration tools on the market. Codeship is a hosted continuous integration platform that favors efficiency, simplicity, and speed. Your teams can use Codeship to test, build, and deploy directly from your GitHub project. It also works with Bitbucket. Codeship’s concise set of features combines integration with delivery so that your code is deployed accordingly once test automation has cleared. GitLab is a rapidly growing code management platform for the modern developer. It provides tools for issue management, code views, continuous integration and deployment, all within a single dashboard. From an idea to production stages, with GitLab you get to put yourself in a bird’s-eye view of how your project is growing and maturing. GitLab ships pre-built packages for popular Linux distributions, it installs in minutes, has a friendly UI, and offers detailed documentation on every feature. Besides the beautiful and rich user interface that Buddy web platform is rocking, you get a high-quality service for automating your development, without the complexity of using custom tools to do so. Buddy’s pride is simplicity, and it shines through their automated pipeline feature which helps developers to test, build and ship their software to production quicker than ever before. Wercker’s CI/CD platform helps software teams to achieve their goals using Docker and microservices. Using container-specific and cloud-native automation features, teams can test and deploy their apps hassle-free. Wercker’s customers praise the platform for being highly efficient towards an automated build and deployment process, making a clear distinction between errors and hiccups along the pipeline. Solano Labs prides itself over its blazing fast platform for Integration and Deployment needs. Customers have reported a significant increase (up to 100x faster) in their time-saving thanks to Solano’s comprehensive tools that streamline your build testing. Solano offers solutions for SaaS companies, private corporations, and cloud-oriented businesses that want to improve the efficiency of their resources. AppVeyor is a Windows-only cloud-based service for testing, building, and deploying Windows applications. Windows devs use AppVeyor’s comfortable technology to conclude their tests and deploy applications in the cloud or in a physical server environment. With pre-installed software like Visual Studio and your favorite SDKs, you can quickly get up and running with a solid CI environment. Change the way you look at quality assurance using Assertible’s infrastructure for continuous testing and monitoring of your apps, websites, and API’s. Assertible’s strong set of features enables teams to worry less about bugs making their way into production, and rather promotes a safe testing environment where everyone has a chance to make the most out of their productive hours at work. Shippable came out of the necessity to give software companies a way to accelerate their growth, without the time-consuming limits of manual labor. Shippable is an integrated platform that’s built with a single purpose to help teams streamline the process of pushing apps to production, apps that have been tested and built for security and stability. Shippable’s mission is to level the playing field by commoditizing custom built CI/CD platforms that companies like Facebook and Amazon rely on and enable every business to evolve faster. Nevercode is a cloud-based CI and CD server that automates the process of building, testing and distributing mobile applications. It requires zero assistance from human personnel, making it highly flexible and reliable at the same time. While many mobile app developers are struggling to set up and maintain their CI workflow, you won’t have to worry about any of that using Nevercode’s direct approach. While PHPCI doesn’t compare to the functionality that of Jenkins, it is a simple and easy to use continuous integration platform for PHP developers. With the fast integration of Bitbucket, GitHub, and local environment, you can have your integration process streamlined as quickly as necessary. If PHP is your daily bread and butter, then PHPCI will ensure that you’re deploying apps that have survived the test of stability that PHPCI provides. Distelli is a growing startup from Seattle that plans to change the way that devops are deploying to their servers, providing an integrated cloud-based service for doing so. With investors like Andreessen Horowitz on-board, Distelli specializes in deployment to Kubernetes, whether it’s hosted on the cloud or your own physical location. A stunning cluster management dashboard lets the team build and connect clusters from anywhere while having the ability to manage them all from a single dashboard. Buildkite has been in the business for the last four years, providing software developers and their respective teams with an easy way to create a self-hosted CI environment. The tool was initially born out of the frustration of the founder, who saw that there’s clear lack of self-hosted CI solutions that provide effortless functionality at a fair price. Today, developers acknowledge the fast performance that Buildkite provides. CruiseControl is an open-source framework built with Java that oversees your continuous build process. It comes equipped with a flexible web dashboard to overview the details of your builds. At its core, it’s a continuous integration platform that can improve the process of developing software. Through plugins, devs can extend their workflow beyond the basic functionality. The Apache Foundation doesn’t hold back when it comes to pushing out great products, and Gump is definitely among the better ones; it’s an open-source CI system that provides building and testing capabilities for Java projects. At the core of Gump is a valuable tool to provide developers with a way to ensure their projects are functional and compatible at all levels of development. Chef has been providing software engineers with a reliable configuration management platform for the last eight years. Written with Erlang and Ruby, the main aim of Chef is to provide an automated environment for how your infrastructure is managed, deployed, and configured — regardless of the size of your network. Chef can be effortlessly integrated with cloud services, physical servers, and hybrid solutions. Buildbot is a Python-built CI testing framework, highly acclaimed among companies like Mozilla and Chromium. Buildbot’s primary function is to act as a bridge for concluding automated tests and builds. Buildbot supports not just continuous-integration testing but also automation of complex build systems, application deployment, and management of sophisticated software-release processes. BuildMaster, from the hard working folks at Inedo, is an app release automation platform. It puts together the powerful capabilities of build management and ARA to create an automated process of continuous integration, database changes, and build deployments. As a web-based tool, it is easy to start using, and all features are ready to go at just a single click away. Configuration is achieved solely through the web user interface, so you don’t have to deal with script configurations. Puppet’s platform is built to manage the configs of Unix and Windows systems. As software, it’s an Open-Source config management tool. Puppet gives developers a way to deliver and operate their software regardless of its origin. Using Puppet’s manifest, you can declare the over frame framework for your infrastructure and apps that you’re building, which gives you a model to use Puppet against for testing, sharing, and deploying changes. CABIE is a continuous automated build and integration environment written in Perl. It’s been around and actively in use for more than seven years, making it one of the most established CI tools, particularly among Open Source options. OpenMake Software is a DevOps continuous delivery platform designed for Agile methodologies, offering continuous delivery tools that enable dev teams to go the “last mile” in Agile. Meister accelerates continuous integration by using build automation to manage, control, and speed up the software compile and link process. Buildout is a Python-based build system enabling you to create, assemble, and deploy applications from multiple parts — even parts not Python-based. Easily create a buildout configuration and reproduce the same software later with Buildout. OctopusDeploy works with your build server to automate releases of ASP .NET applications and Windows services. OctopusDeploy enables reliable, secure, and automated releases into several different environments — including test, staging, and production — both on-premises and in the cloud. Instead of replacing your source control and build servers, OctopusDeploy takes over where they leave off, taking your build artifacts and configuring and distributing them to all machines and environments you need them to run on.